Dubai’s first tropical rainforest opened in the heart of the city last week boasting 3,000 species of plants, animals and birds in a tree canopy high above a giant aquarium full of exotic fish. The Green Planet project, which opened on Thursday in City Walk, Jumeirah, was three years in the making and gives visitors a glimpse of porcupines, sloths, snakes, spiders and a huge array of exotic birds, to name a few. 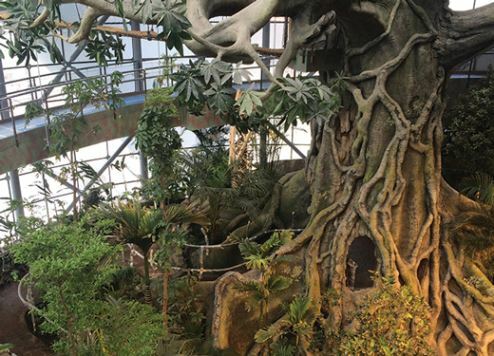 At the heart of the attraction, which is housed in a biodome, is a huge tree trunk, which is artificial, but each planter is packed with tropical flora and fauna. Eventually they will take over the structure to create a living environment in which tropical species can thrive. It will be the world’s largest fabricated, life-sustaining tree. Eric Hupperts, a Californian wildlife expert who moved to ­Dubai in January, is living exhibits manager and curator at Green Planet. Environmental parameters in the biodome have been designed specifically to maintain the plants and wildlife, with humidity set at 70% and temperatures between 25°C and 28°C. Stepping into the origami-style glass building immediately transports visitors into another world. The "flooded forest" stage offers a first look at the base level of a tropical ecosystem. The giant aquarium is filled with species such as arapaima, arowana and graceful stingrays to replicate the kind of fish and animals found in underwater tropical environments. A lift carries visitors to the roof of the biodome, offering a panoramic, treetop view of the ecosystem, with the waterfalls, steam and noises associated with the Amazon rainforest. The Green Planet will 15 offer educational programmes for children across five topics and three age groups with the aim of improving their environmental awareness.